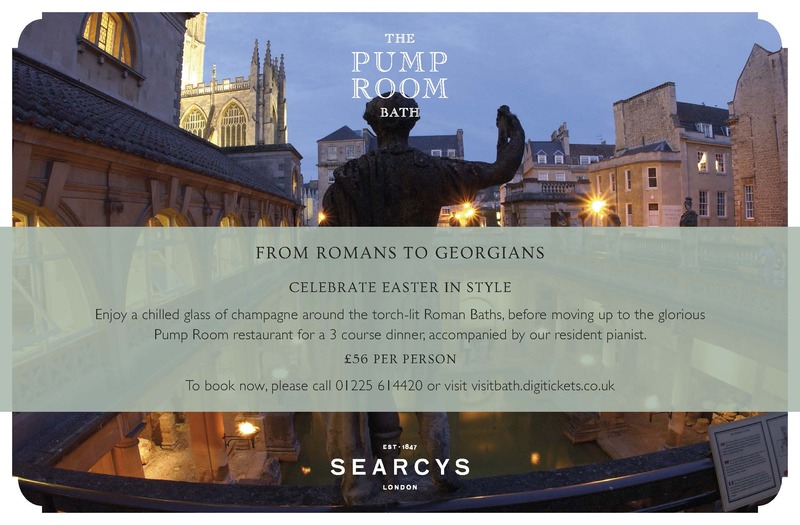 Start the evening with a magical tour of the world-famous Roman Baths Museum, ending with a glass of Searcy’s champagne around the steaming waters of the Great Bath. Discover Roman treasures by torch-light – you may even be greeted by the Romans themselves! After the tour, make your way to the Georgian splendour of the Pump Room, where you’ll enjoy an indulgent, three-course dinner accompanied by our resident pianist. Relax, soak up the atmosphere, and wash it all down with a glass of our famously reviving spa water. Click here to view the Romans to Georgians menu. Tickets are £56.00 per person and dinner reservations are available from 6.00pm to 8.00pm. Please click here to book your tickets and scroll down to book a table. We would recommend allowing two hours for exploring the Roman Baths. The bar is approximately half-way through the tour, so make sure you leave plenty of time to enjoy the Great Bath with a drink in hand. Alternatively if you would just like to join us for delicious Easter Evening Dining in the Pump Room, rather than the whole package, we will be open until 8.30pm and you can view the menu here. We recommend booking a table to avoid disappointment.